John Howes is an entrepreneur, pet lover, passionate blogger and the founder of Petcareup. He loves to write about pets and helps pet owners to choose the best products for their pet. In this article, John shares 7 tips for taking your dog on a boat holiday to ensure a smooth and safe trip for you and your furry friend. It is very nice to take your dog with you while you are travelling, (s)he is your best friend after all. Boating with your dog will be the most exciting thing you can do, for both parties it can be an experience of a lifetime. Reading through these guidelines before you hop on board will make the experience safe and smooth. Planning is very crucial for any holiday together with your beloved pet, but especially when you go boating for the first time. Create a trip-plan by thinking about how you want your trip to be like. What kind of activities will you be doing? Will you be on and off land or mostly at sea? And search for some information about local vets – better be safe than sorry. Life jackets play a vital role. As good as a swimmer your dog might be in the quiet lakes around your hometown, the open sea is a bit tougher. So a life jacket for everyone onboard is an essential element. 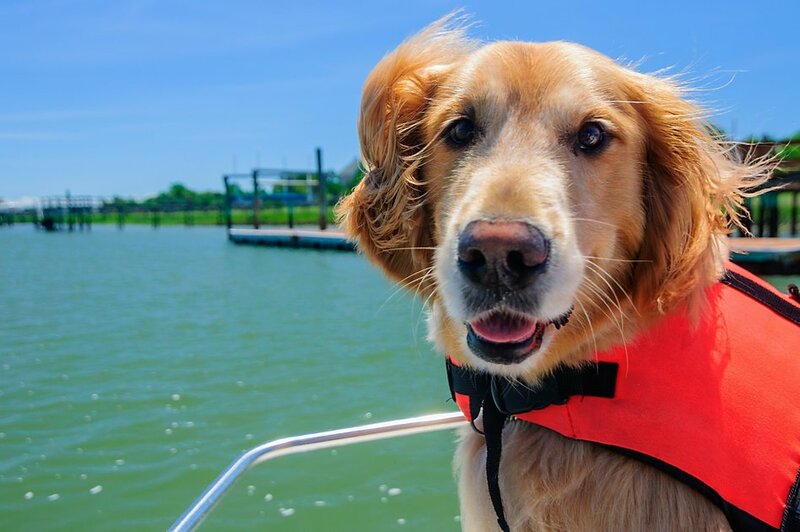 Pets’ life jackets contain side handles so that you are able to grab the dog whenever it might look like he needs some support. Just one more tip: if it looks like your dog is having difficulties in the water, you should always avoid grabbing him by the collar. Use the handles on the lifejacket instead. There is always a first-aid kit on board of every boat you charter. But, those first-aid kits are not equipped with the pet specific supplies which might come in handy. For example, when your dog accidentally scratches itself, an antibiotic ointment is very useful and helps avoid any major infections. 4. 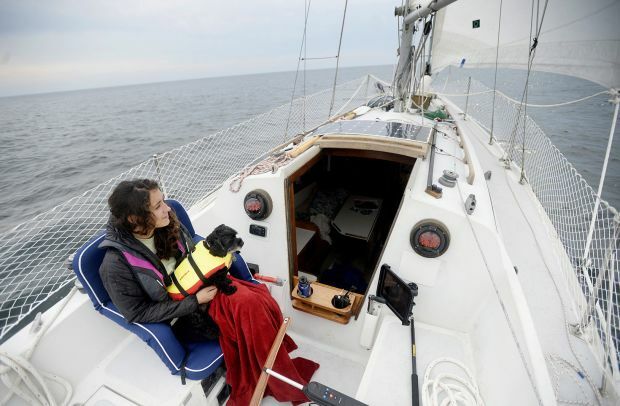 Would your dog feel comfortable on board? When you are about to book a boat online, check out the boat pictures a bit more in-depth. Some dogs need a bit more time to get adjusted to a new environment compared to us. On the pictures online you can already see if there are any cosy corners or other spots where your dog can feel at home in an instant. Bringing a towel or shoe that he likes to chew on at home also helps to make him feel comfortable immediately. You might know this from other trips you took with your dog, but going abroad with your pet also means you need some documentation. Some countries like to see a specific list of vaccinations or you might need your dog to be micro-chipped. Besides those general laws, there is a chance that there are also some rules regarding pets onboard. If you want to know the current situation of the country your heading towards, you can always ask by commenting on this post. On the first day, going out for two or three hours is probably long enough. 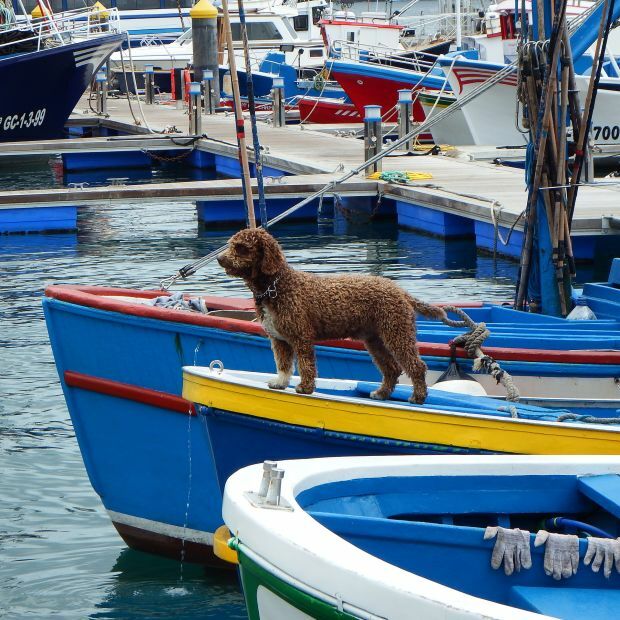 Your dog has no idea what he just got into and making sure he can adjust to the situation on the water can ensure that your dog will love to go sailing for many years to come. As long as you slowly build it up and pay attention to how your dog is behaving onboard, there is a big chance your dog will become a full-time sea lover. One thing you don’t want to have is a lack of food or toys when you are out in the open sea. When writing your packing list, make sure to put these things on it: dogfood, water, bowl, puppy pads (in case there’s no time for a potty break) and some soft toys. A top 8 of my favourite dog foods can be found here. There’s no doubt that you want what’s best for your pets. Therefore following these tips for taking your dog on a boat could make the next boat holiday a breeze. Curious about which boat would fit best you and your soon-to-be pirate dog? Contact our team of holiday experts and they will be happy to help you.